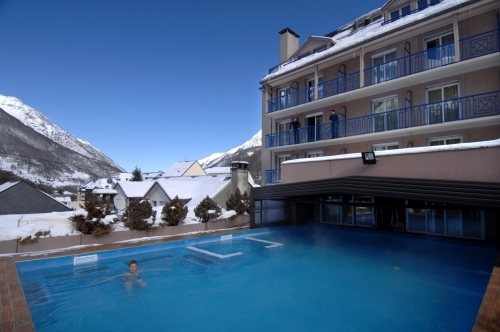 Hotel Le Bois Joli is situated in the centre of the beautiful spa town of Cauterets, close to all the shops and a short walk from the Gondola and the ski school which is located in the ski area at the top of the Lys Village gondola (100m). 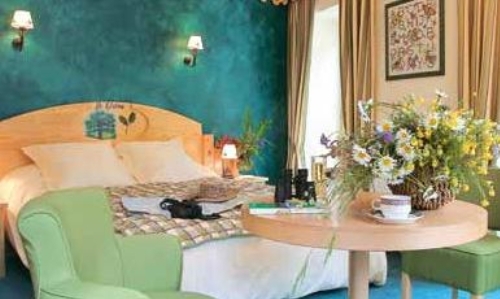 Located in the heart of the pretty Baroque spa town of Cauterets is the friendly and welcoming Le Bois Joli. The hotel’s classic grand facade with its balconies and brasserie awning are perhaps more akin to something you would see on the streets of Paris. Inside, this small and traditional mountain-styled hotel is centred on the family-run brasserie-bar with its crafted pine panels that are hand painted with local flowers and its antique cash till that sits proudly at the end of the bar. Perhaps the hottest seat in the house is under the mini mechanical gondola that winds its way around the bar – a clockwork miniature which both children and adults alike will marvel at. 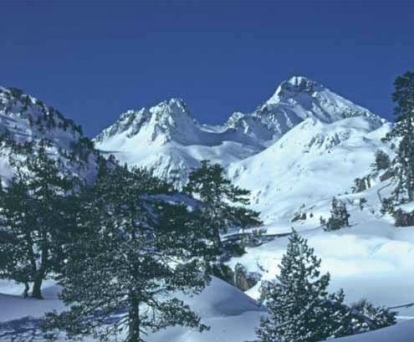 And speaking of gondolas, the Lys Village gondola which whisks you up to the ski resort of Cauterets is just a short walk away. 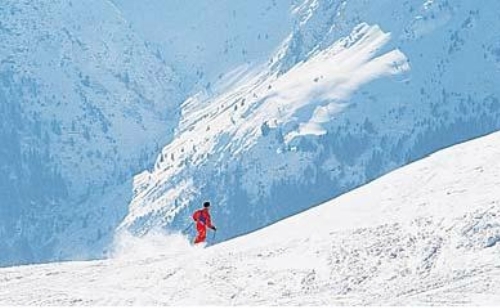 Situated in a sunny bowl, the ski area is easy to navigate and has something for everyone: from lazy blues to challenging blacks, free-ride and terrain park. After a hard day on the slopes the sunny terrace out front is the perfect spot to catch some winter sun as you relax with a crisp glass of the local Jurançon blanc. If it is too cold outside then why not head inside for a warming shot of Genepi. If you still need a warming up after that, then head to “Les Bains du Rocher”; this beautiful Baroque style building perched on the hill overlooking Cauterets, is the town’s longest standing thermal spa centre and is a sensory experience of indoor and outdoor hot pools and relaxing hydro massage will invigorate the most tired of bodies. 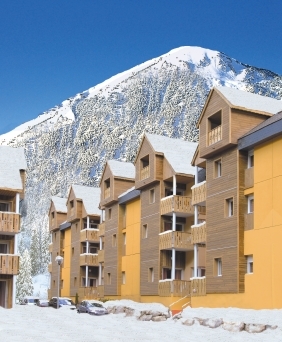 The bright and airy balconied rooms continue the traditional mountain theme with pine furniture, pastel tones and hand painted doors that are evocative of the flora and fauna of the area whilst balconies provide great views of the surrounding mountains. 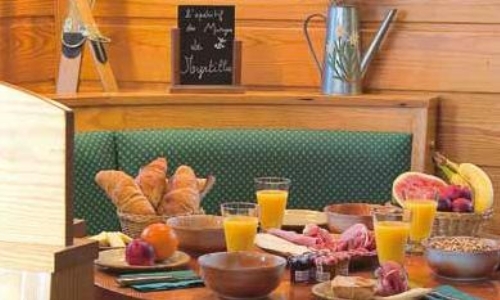 The continental breakfast is served in the brasserie-bar and for those in need of a more substantial morning fix, the “Montagnard” bre4akfast option tempts with local cured ham and cheese. 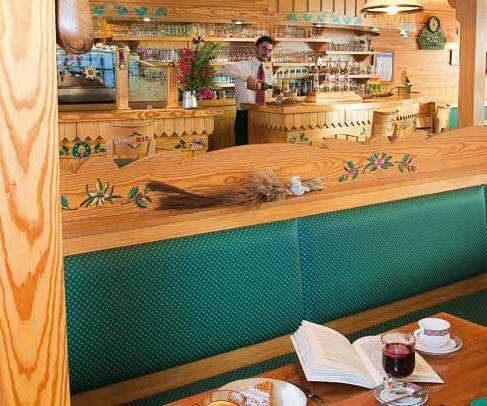 In the evening, why not experience a typical local dish of hearty Garbure at the rustic mountain chalet-style restaurant next door? Complete with cosy sheepskin throws and an oak-barrelled drinks caddy, it’s a fun and welcoming place to relax for an evening meal. 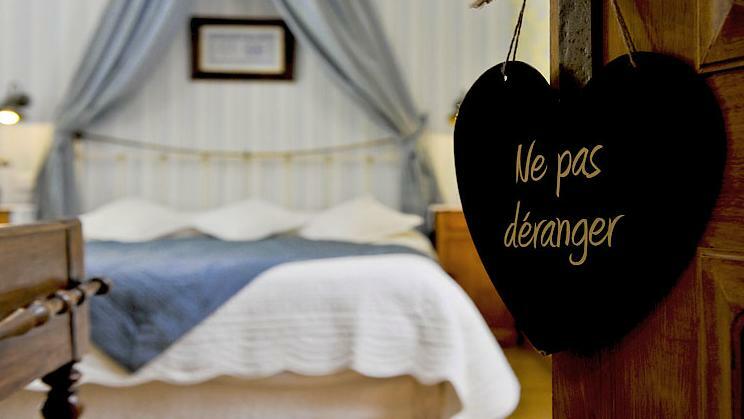 All the comfortable rooms at Hotel Le Bois Joli in Cauterets have been lovingly decorated and furnished to reflect the beauty of the Pyrenean nature and are named after the indigenous flora and fauna. All the rooms have a flat-screen cable TV, safe, telephone, Wi-Fi internet access, a bathroom (bath with shower attachment) with a hairdryer and heated towel rail and a separate WC. Some rooms have a balcony. Double Room with balcony sleeps 2 (ca. 30- 35m2): Double bed with ensuite bathroom & separate WC. Corner balcony overlooking the small square and quiet side street. Twin Room with balcony sleeps 2 (ca. 30- 35m2): Twin beds with ensuite bathroom & separate WC. Corner balcony overlooking the quiet side street. Family Room with large balcony sleeps 4 (ca. 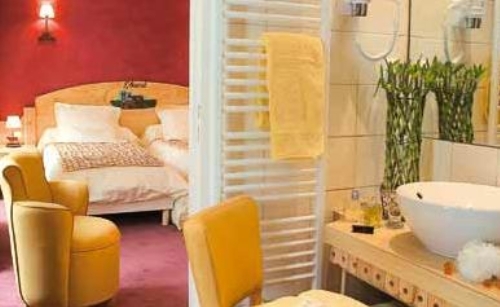 40- 45m2): Alcove with bunk beds in the entrance hallway, bathroom & separate WC. Double bedroom with front balconies overlooking the small square. Please note: for any rooms that feature bunk beds, sleeping in the top bunk is not recommended for children under the age of 6 years old and not for children over 14. 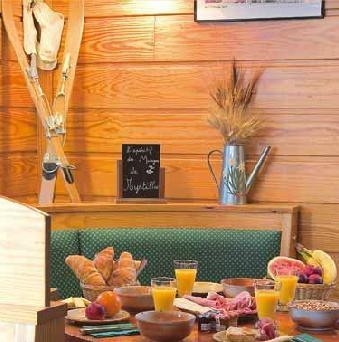 Fully sound insulated room on bed & breakfast basis (continental breakfast), TV, Chalet-style Brasserie-Bar (serving breakfast) with sun terrace, ski storage, free Wi-Fi, lift, left luggage room. 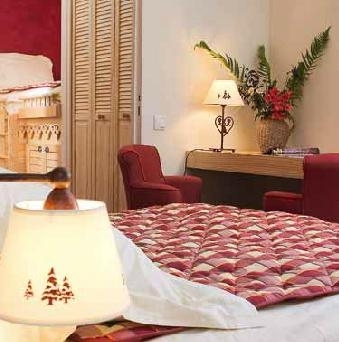 Cots are free of charge and available in the rooms (subject to availability, request at time of booking). Open: 08.00 – 22.00 daily. 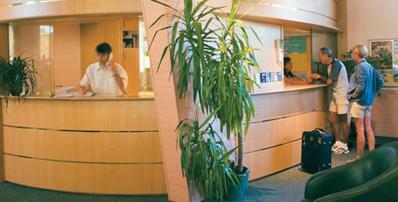 Arrival day at Hotel Le Bois Joli is daily from 14:00 and Departure by 11:00.